The state of Docker and the container ecosystem was the touchstone for discussion at The New Stack’s most recent pancake breakfast / podcast recording session, hosted by Alex Willams at ContainerCon 2015. Joining Alex were Krishnan Subramanian, director of OpenShift strategy at Red Hat, Aneel Lakhani from the marketing team at SignalFx, Erica Windisch, a security engineer at Docker, and Sam Charrington, analyst with The New Stack. “You still need some kind of scheduling system that tells resources where to go when you’re splitting resources between things, whether it’s in VMs or containers,” he said. Join us in the big tent for a short stack with The New Stack, sponsored by Cloudsoft and Apcera. 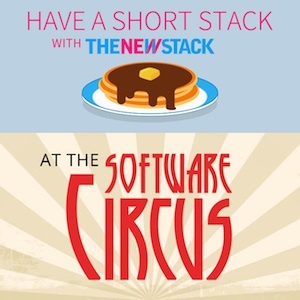 Software Circus is offering a 40% discount to readers of The New Stack. Register with the discount code: THENEWSTACKATTHECIRCUS. Software Circus is also offering free admisssion to women and people in the LGBTQ community who want to attend the conference. Register with the code: COMEONECOMEALL. Alex and Sam discussed putting together The New Stack’s Docker and Container eBooks Series, and Sam talked about having just finished compiling an ecosystem directory including more that 100 participants that have some kind of Docker products. Alex persuaded Krishnan to compare Kubernetes and Mesos. “Right now, Kubernetes is emerging as a standard for orchestration, but there are others, including Docker’s own orchestration plane, and Mesos calls itself a ‘datacenter operating system,’ so it’s an open game there,” said Krishnan. After a couple more use cases from the audience, the focus shifts to governance of microservices. However, both Krishnan and Aneel said that, regarding tools to handle the governance of microservices, not much exists for now. Alex asks Krishnan how OpenShift manages policies. “We manage the policies on the deployment level. We don’t handle the governance or management of microservices. We are a platform to deploy microservices, so we handle everything underneath,” said Krishnan of OpenShift. For future short stack sessions on the pancake breakfast circuit, keep an eye on the events section of The New Stack. Docker, Red Hat and SignalFx are sponsors of The New Stack.